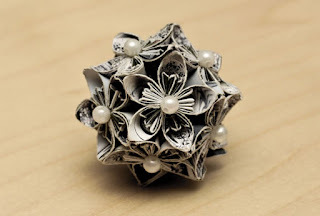 What you will need to make your own Kusudama paper ball? 1. Paper – 60 square pieces of paper, all of the same size. I use advertising catalogues (for your convenience in the first part of this tutorial I use plain blue paper so that the folds are more visible). My squares are 3,5 cm x 3,5 cm but you can make them bigger, smaller squares would be rather hard to fold. For every flower you will need 5 pieces. 5* Scissors (optionally) I prefer torn paper instead of cut. I fold it several times before tearing slowly. 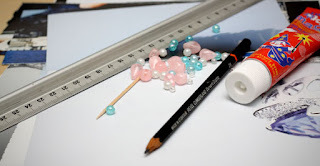 6* Beads (optionally) Use them to add some extra glamour. 7. Toothpick – to apply the glue. 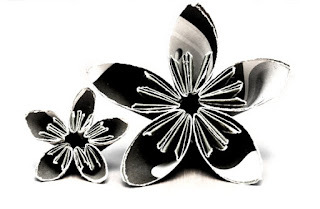 Now you have to glue your 5 petals into a flower. Don’t glue every petal right after you make it. Make the whole 60 and then glue them into 12 flowers, it’s really faster this way, believe me. When all 12 flowers are finished you have to glue them together. You start with gluing the first half – six flowers together. With your first flower you have to apply the glue on two adjacent petals, with five next flowers you apply glue on three adjacent petals. Put the glue not exactly on the middle line of the petal but a little to the right. When two halves of Kusudama Flower Ball are ready you have to glue them together. You can put a cord between the halves so that your ball can hang down. I make my Kusudama Flower Balls for a table decorations so I don’t put a cord. Here is how to make felted balls.